The art of Tufted Ducking. I learned an important lesson in December of 2012. 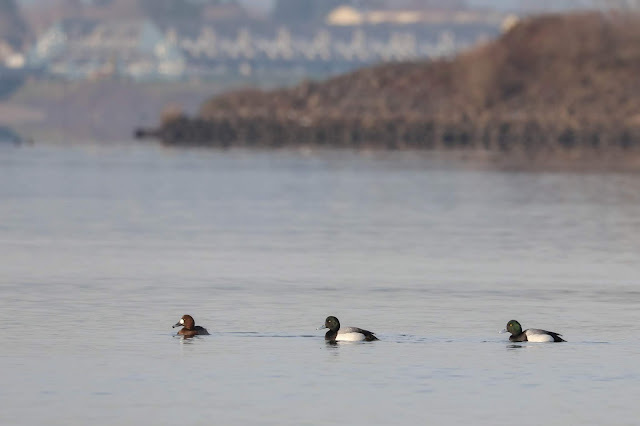 It was my third winter of chasing reports of a Tufted Duck hiding in the massive scaup flocks that linger in the Columbia River. I chased and dipped, chased and dipped, froze my fingers and melted my brain trying to sort scaup. 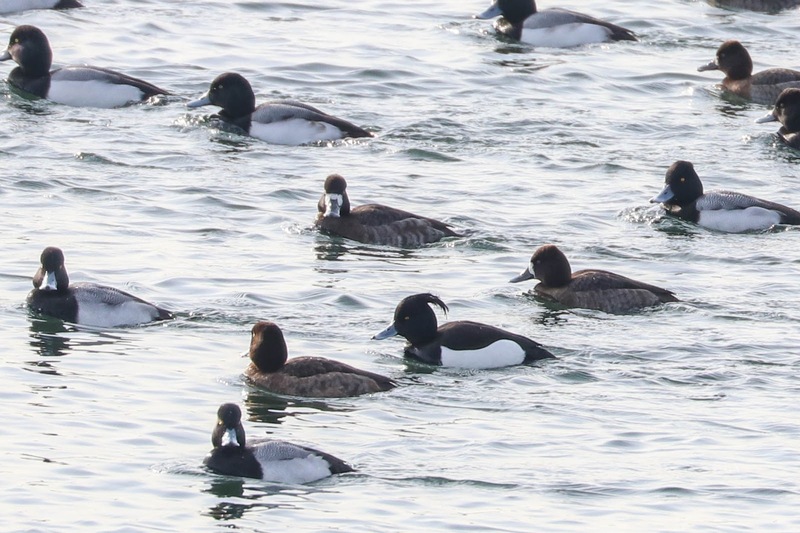 Then one day I was walking the dogs at Broughton Beach and boom, the Tufted Duck was the closest bird to shore. That's when I understood, you do not chase the Tufted Duck. It chases you. 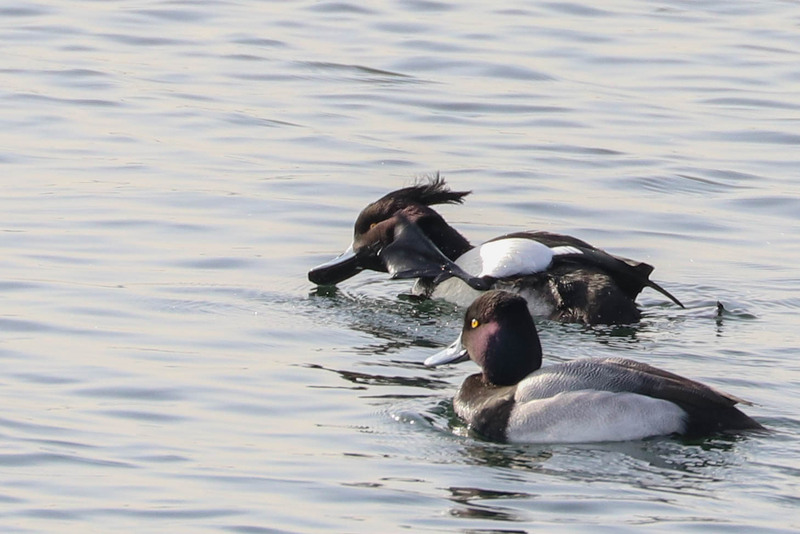 A Tufted Duck is cool, and so you must also be cool. When one was reported by a local birder last week in my 5MR I knew exactly what to do: be cool, don't chase, act nonchalant. Finally yesterday I felt the urge to bird Marine Park which is connected to the park where the duck was seen. I left my scope at home because I was not going to chase that duck. When it's 23˚ outside you might think that sturgeon did not smell as much. No. It smelled a lot. 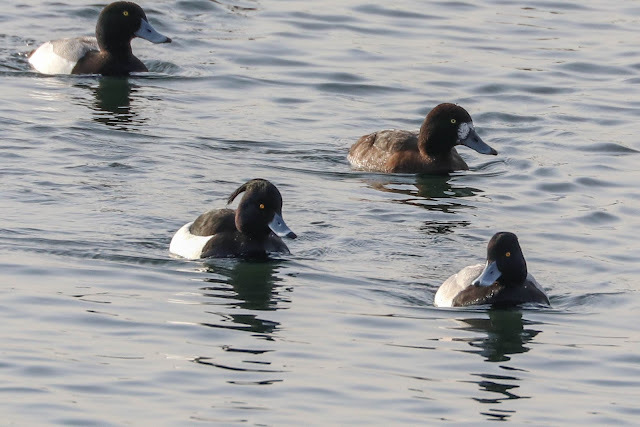 I walked west along the beach to the boat ramp where a couple of docks protrude into the river quite a bit and a bunch of scaup were swimming about. 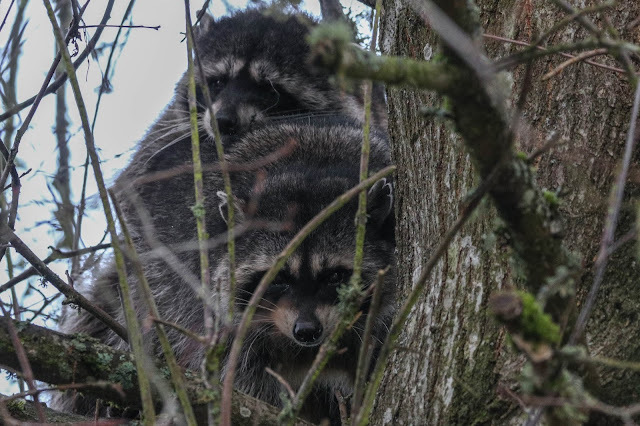 They were less afraid of me than usual it seemed. 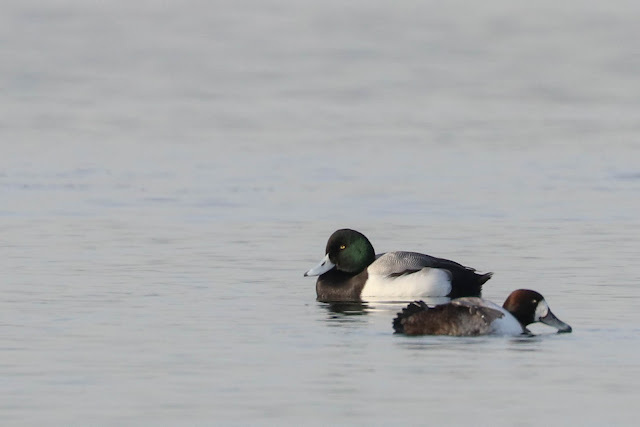 Most of the close scaup were Greaters, which is nice because they are generally less common. 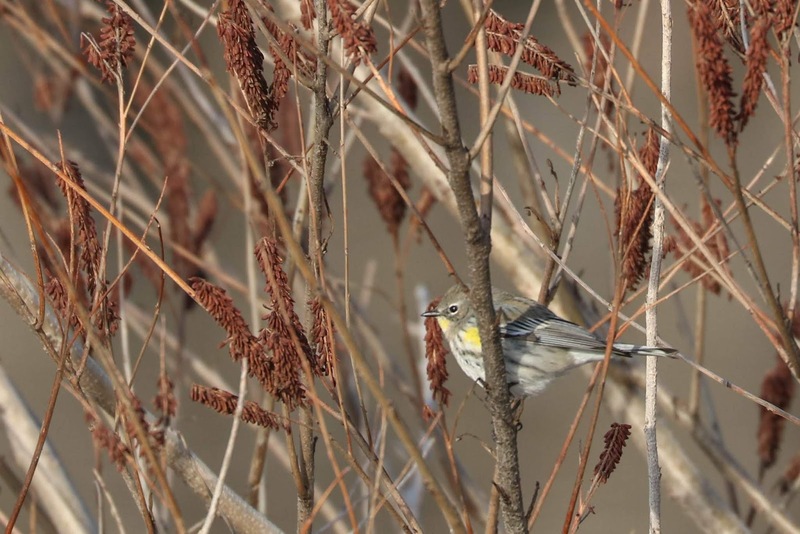 In some shrubs next to the dock a Yellow-rumped Warbler was having no trouble finding chilly insects to snack on. 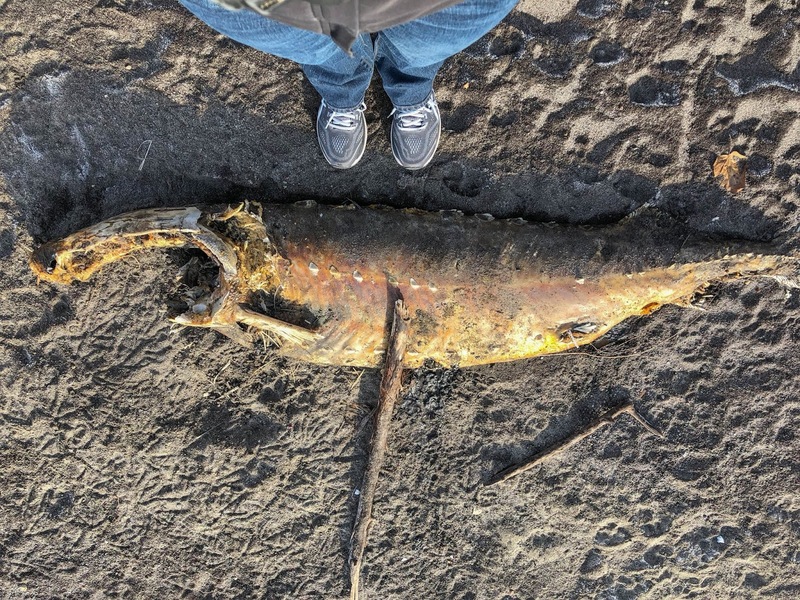 I walked back along the beach ignoring the thousands of scaup out on the river that would require a scope to view properly, past the stinky sturgeon, and headed to the bike path. 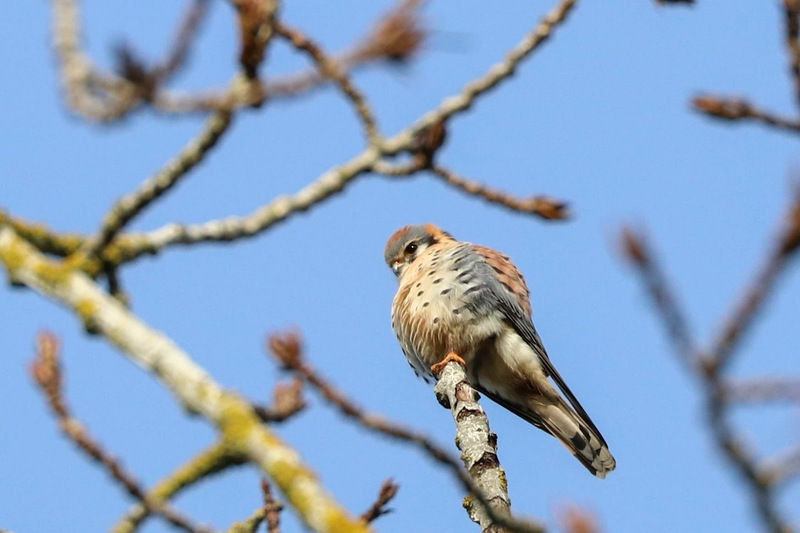 An American Kestrel was perched at the top of a tree by the main fields of the park, a new bird for me there. I followed the bike path through the woods to where it pops back out at the river by the condo complex. A flock of scaup were very close to shore. I smiled. 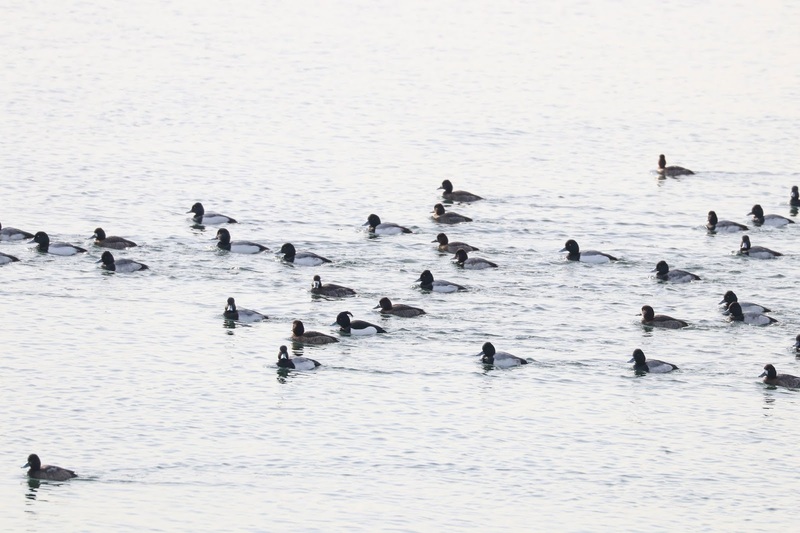 The Tufted Duck would be in this flock or I had not learned anything at all. That's about when I started laughing to myself, semi-maniacally, because really this should not have been true at all. Everyone else's views of this bird were distant, through a scope, or in bad light. This bird was close to shore in fantastic February sunshine, completely unfazed by me creeping on it. At one point it even swam closer. Eventually I pulled myself away from this ridiculousness and walked to the little jetty. 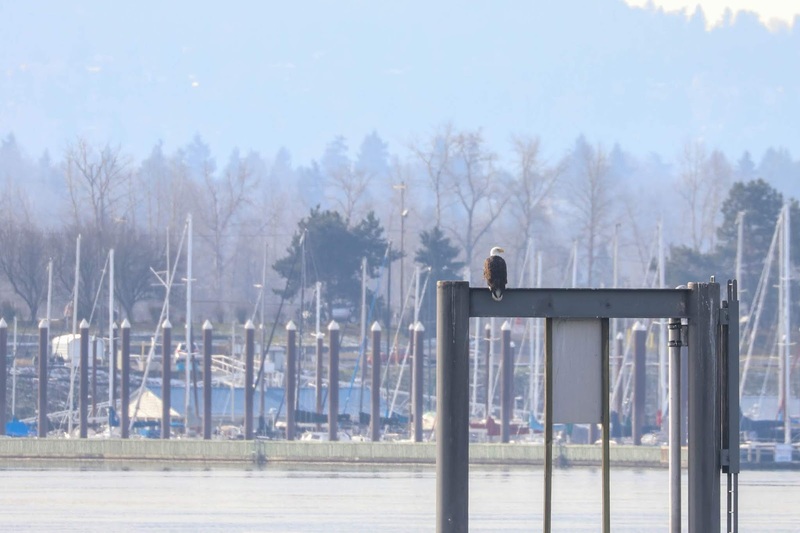 Two Bald Eagles showed up and sent everything scattering in starling-like swarms. The birds settled but I did not try to find the Tufted again. 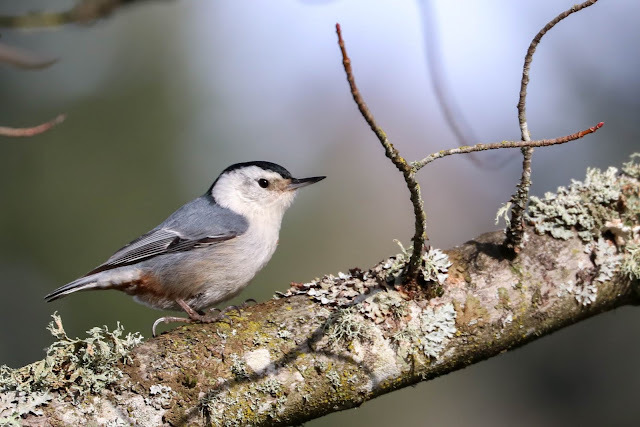 I walked back along the bike path and heard a White-breasted Nuthatch calling. They are almost always calling at this spot but this time one was low and allowed me to take some photos. I made it back to my car where I found a Red-breasted Sapsucker pecking at a pine tree directly in front of me. A pleasant way to end my outing. This whole experience represents much of what I have enjoyed about 5MR birding. 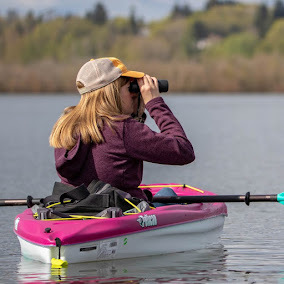 Instead of chasing birds I am just birding places I want to bird, staying close to home and finding really cool stuff. With that in mind let me throw out a few more fun finds from my 5MR since my last blog. One morning I went to bird my patch, Meadowbrook Marsh, and saw movement up in the tree next to where I parked. Totally unexpected and interesting and weird. 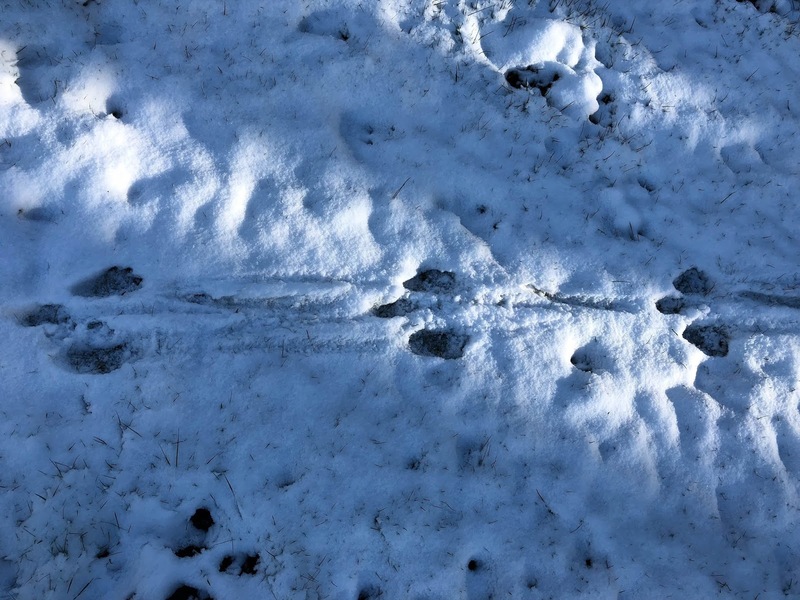 This week when it snowed Jacob and I headed to Columbia Springs Fish Hatchery, hoping for some birds in the snow. Not a ton of photo ops but we did see a cool trail of tracks which I shared on Instagram. It thought maybe river otter, but one guy that does a lot of camera trapping believes it to be a beaver trail with a tail drag. 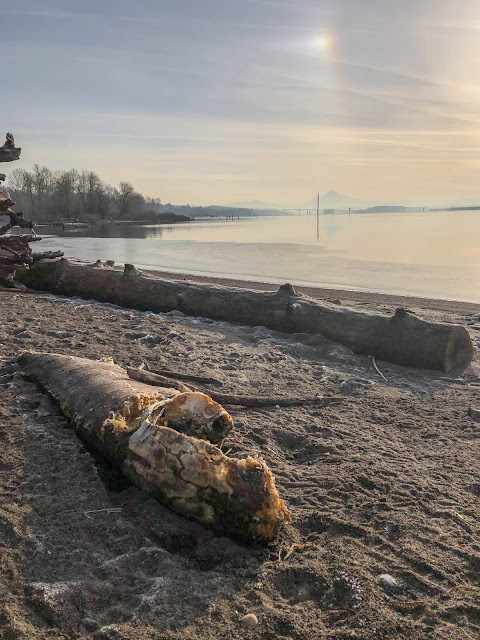 Last week I visited the hotspot I cleverly named "Burnt Bridge Creek between NE 137th Ave and NE 162nd Ave." It's a large area that includes fields, marshes, Wal-Mart, and some woods that creeps me out too much to enter. I noticed a couple birds fly into the oak trees, one of which looked larger and interesting. 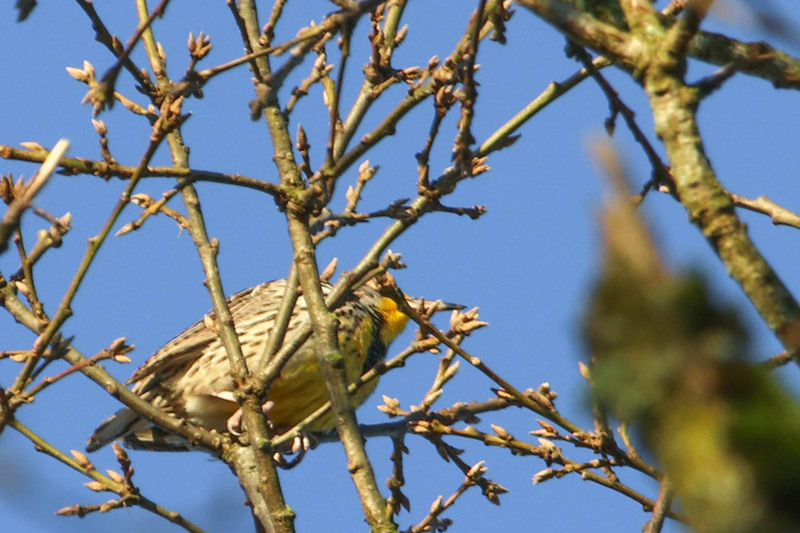 I finally picked it out from behind a million branches and found it was a Western Meadowlark! This was very surprising to me though the habitat seems just fine for a meadowlark. My plan that day was to finally walk all the way around this area to NE 162nd where some more fields and a dairy farm seemed promising. I learned 162nd is very busy and noisy, but the field on the east side of it had two or three more meadowlarks! Yay! On Saturday Jacob and I left our 5MR in search of some scenery and wildlife in the Gifford Pinchot National Forest. We wanted to visit an area we had been a couple times last summer but got derailed by snow, so we just drove around random forest roads. At one point Jacob slammed on the brakes. 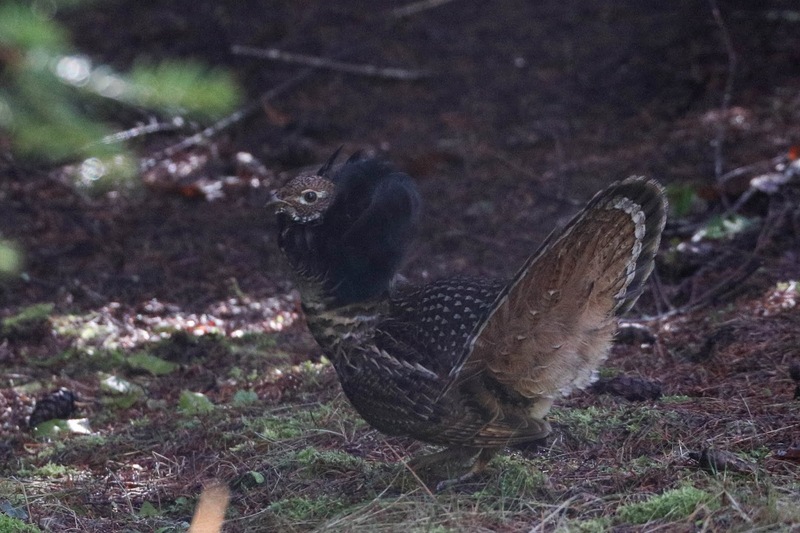 He had seen a grouse so we slowly backed up and found not only the female grouse he had seen, but a stunning displaying male Ruffed Grouse! Cooler than a Tufted Duck? Yeah, I think so. It's been a good week of birding! Good times!!!! 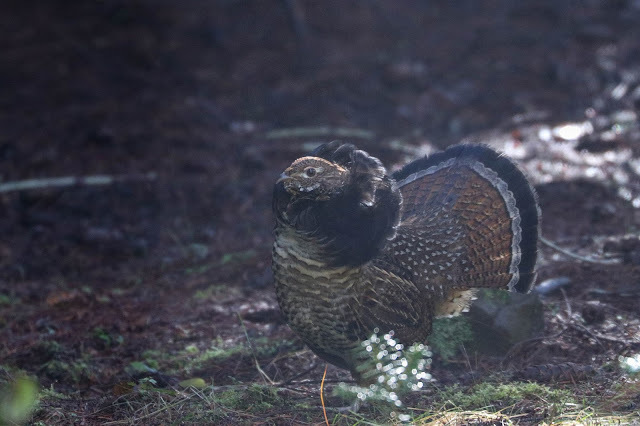 Man, I love that grouse. Thanks for the needed reminder than 5MRing should be chill. I liken this metaphor to the guy who shows up to the gym with all the fancy and expensive equipment. They are most likely NOT the best person on the court. Just do your normal thing and the good stuff will happen! Your tufted duck story makes me happy. Great wisdom there. Thanks for sharing these stories and photos :) Wow, that Ruffed Grouse! 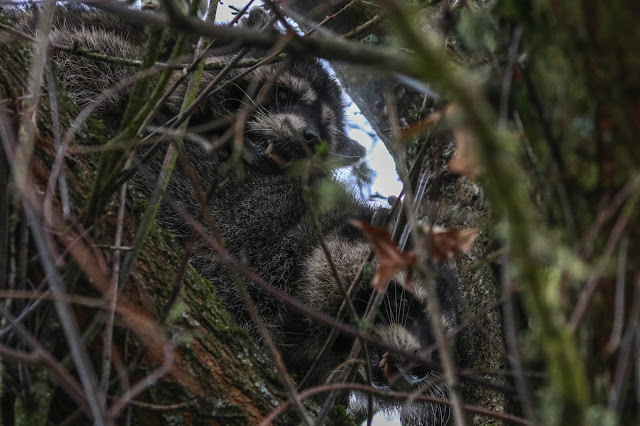 We really love that feeling of finding something unexpected just by exploring local areas (versus chasing and introducing potential disappointment into our birding). Oh yeah, chasing and dipping can be mentally draining. 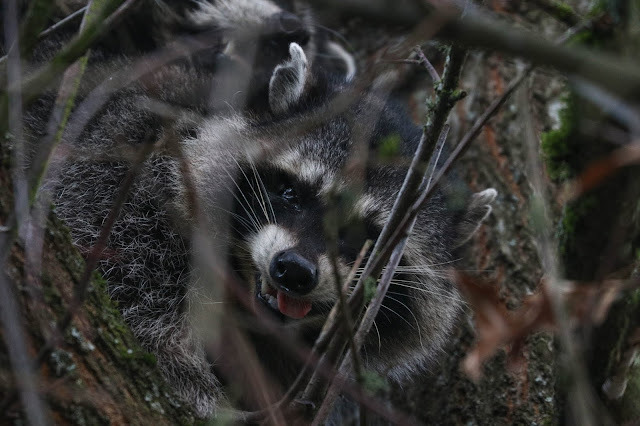 The o-face raccoon with the tongue out is not something I will ever forget. 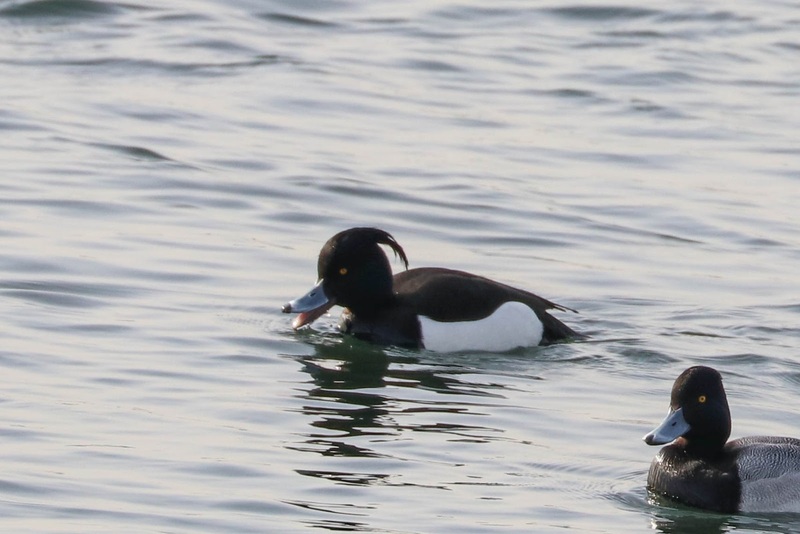 Well done on the Tufted Duck, that is a super tufty one too. Will remember to not bring a scope when I am near waterfowl. I don't think I'll be getting one of those in my 5MR, but now that I think about it I had TUDU in 3 historic 5MRs, not bad! The displaying grouse envy is real. Wow, I am impressed that you can remember so many places you lived and what was in their 5MRs. The Grouse is awesome too and I love the photo of the Nuthatch! Haha, yeah sometimes you do need to bring a scope. Glad you got to see a Tufted Duck! You did see it... right? Between the casual TUDU and the displaying RUGR...this post is what multiple dreams and fantasies are made of. This...this might be too much. I may need to take a break from your blog for a while. Ha! Fancy birds are everywhere it seems! Funny about the raccoons! Gotta keep warm somehow I suppose.